The 55-meter tall Ariane 5 lit its liquid-fueled Vulcain 2 engine at 21:38:32 UTC and lifted off upon ignition of its powerful boosters seven seconds later, rising with a thrust equivalent to ten Airbus A380 aircraft at full throttle. With the collective power of its boosters and main stage, Ariane 5 swung onto a due easterly flight path for a 20-minute overflight of the Atlantic Ocean. 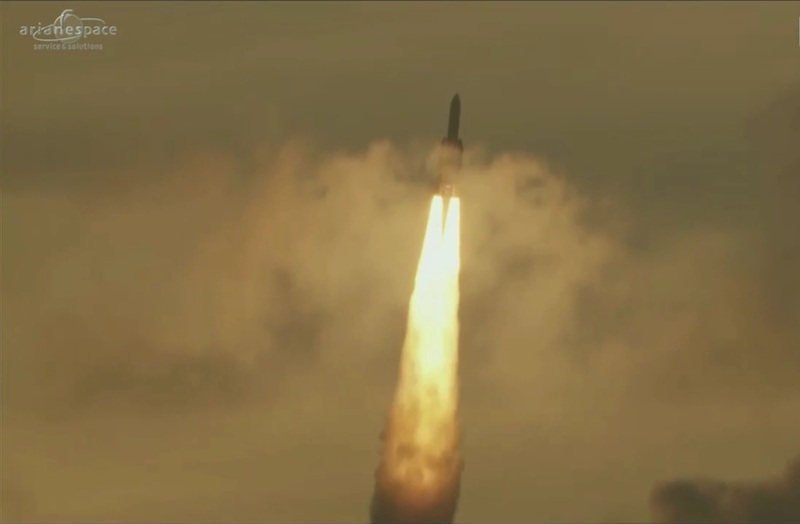 Blazing into partly clear skies, Ariane 5 accelerated beyond the speed of sound within 49 seconds of liftoff, its two boosters delivering 92% of the vehicle’s total thrust. The workhorse launcher dropped its two boosters 67 Kilometers in altitude, two minutes and 21 seconds into the flight and continued its ride powered by the 136,000 Kilogram-force Vulcain 2. The payload fairing separated as soon as the rocket had climbed out of the dense layers of the atmosphere and the first stage finished its part of the mission just shy of T+9 minutes, lofting the stack to a sub-orbital path with 159-Kilometer apogee. Assuming control of the mission, the second stage’s 6,400 Kilogram-force HM-7B engine fired for sixteen and a half minutes to directly insert the stack into Geostationary Transfer Orbit. 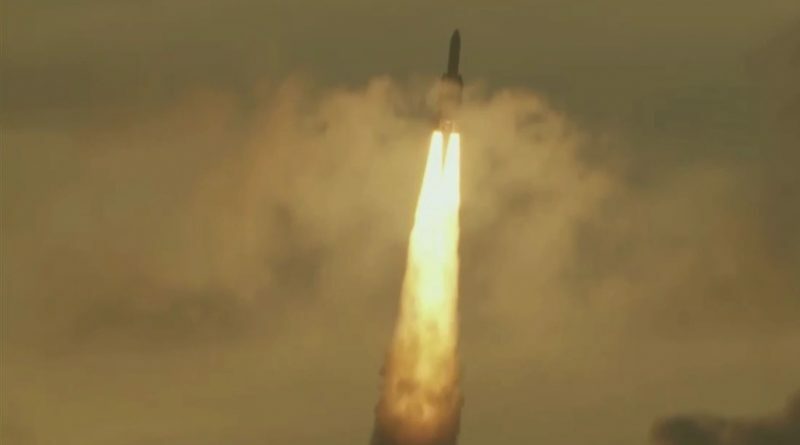 The mission’s propulsive phase came to a close 656 Kilometers in altitude with Ariane 5 having achieved a planned speed of 9,635 meters per second. Having reached the African Coast, the second stage prepared for the separation of this mission’s passengers – EchoStar 18, a 6,300-Kilogram satellite riding in the upper payload slot, and BRIsat affixed to the launcher’s second stage and hidden by the Sylda payload adapter that gives Ariane 5 the ability to lift a pair of heavy satellites. The EchoStar 18 satellite was deployed 29 minutes after liftoff into an orbit peaking 35,800 Kilometers above the equator from where the spacecraft will make its way into a Geostationary Orbit, locked with the Earth’s rotation to remain centered above its coverage area. The second stage then ejected its hollow Sylda adapter to reveal BRIsat, the first dedicated banking satellite operated from GEO, sent on its way 42 minutes after launch. Ariane 5 had to wait over a week for the VA230 mission due to repeated ground support equipment issues pushing the launch from a June 8 target and again from Thursday as technicians worked to replace faulty umbilical connections between the rocket and Mobile Launch Table. A launch attempt on Friday had to be scrubbed after loading the Ariane 5 with 176 metric tons of cryogenics due to strong Upper Level Winds. Saturday’s countdown was not without issue either as ground systems readiness first pushed the launch 14 minutes into its window followed by an abort of the Synchronized Sequence at T-2 minutes and 24 seconds due to a balky valve on the launcher’s cryogenic core stage. 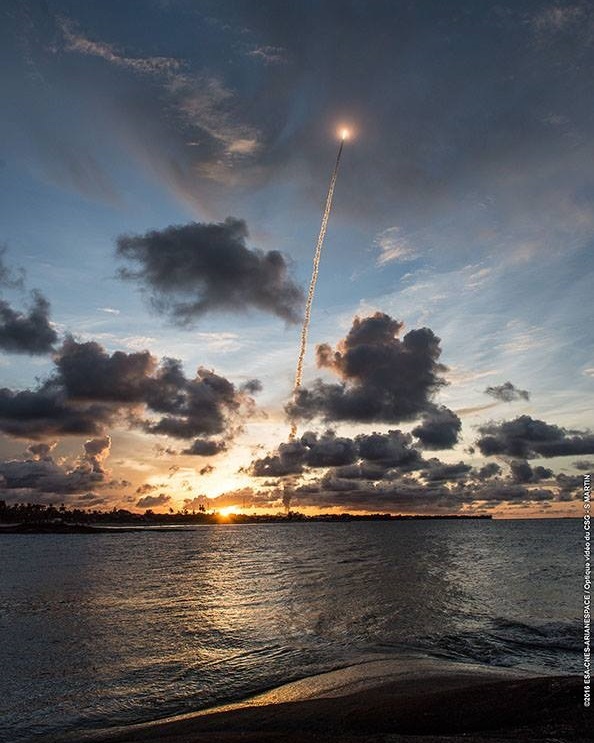 Engineers quickly diagnosed and resolved the issue to permit a liftoff under two minutes before the day’s window expired, moving the thundering departure of Ariane 5 close to local sunset, making for some nice views of the ascending rocket as it headed towards darkness over the Atlantic Ocean. 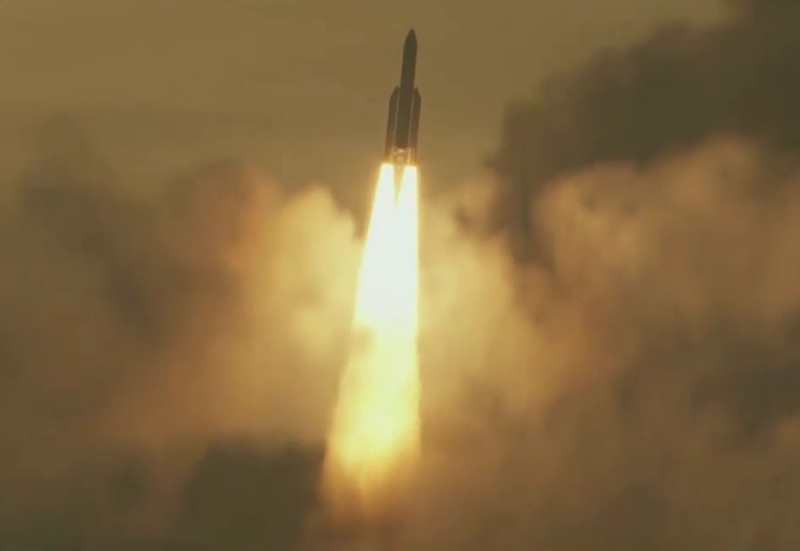 Although the run-up to launch was not as smooth as expected, the flight itself made up for the minor speed bump as Ariane 5 achieved its 72nd consecutive success. 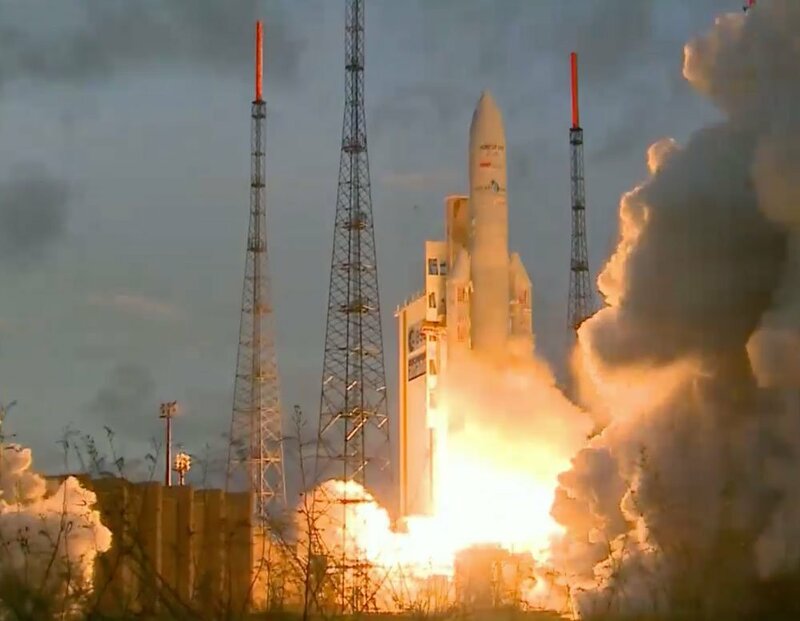 Lifting pairs of communications satellites into Geostationary Transfer Orbit is Ariane’s bread and butter business and Friday’s mission was no different, aiming for an orbit of 249.3 by 35,786 Kilometers, inclined 6.0 degrees. Arianespace CEO Stephane Israel confirmed the target orbit was reached according to telemetry beamed from the launch vehicle to its African tracking station. Saturday’s Ariane 5 mission set a new record for the heaviest payload delivered to Geostationary Transfer Orbit by the workhorse launcher. The two satellites and their various adapters had a collective mass of 10,731 Kilograms, improving over the previous 10,500-Kilogram record. The two satellites delivered to orbit had a net weight of 9,840 Kilograms, marking a 337-Kilogram increase over the previous record set on the VA212 mission in February 2013 and underlining Ariane’s power and flexibility when it comes to hauling heavy payloads into GTO. The VA230 was also the first time two satellites built by Space Systems Loral shared an Ariane 5 rocket. 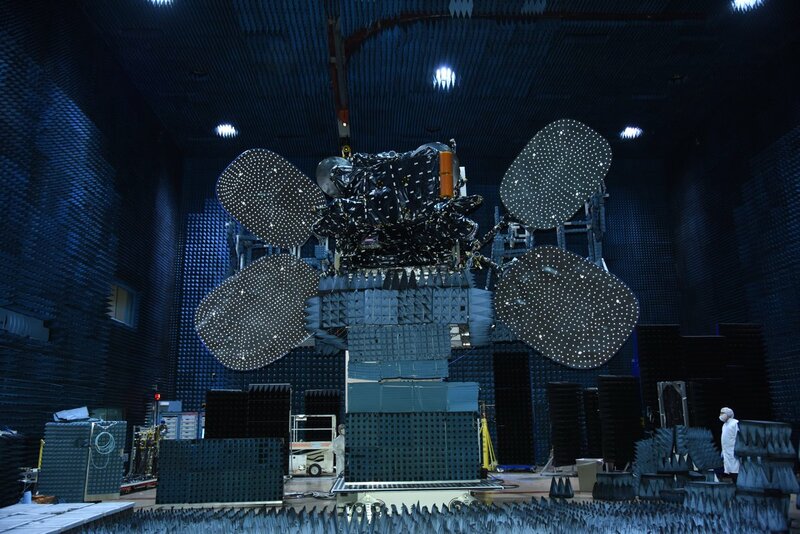 Both are based on the LS-1300 satellite platform, EchoStar utilizes a high-power configuration while the smaller BRIsat employed a medium-power version of the flexible satellite bus. EchoStar 18 will maneuver itself to an orbital perch at 110 degrees West in Geostationary Orbit from where the satellite can deliver services to the Continental United States, Alaska, Hawaii, Puerto Rico and Hawaii. 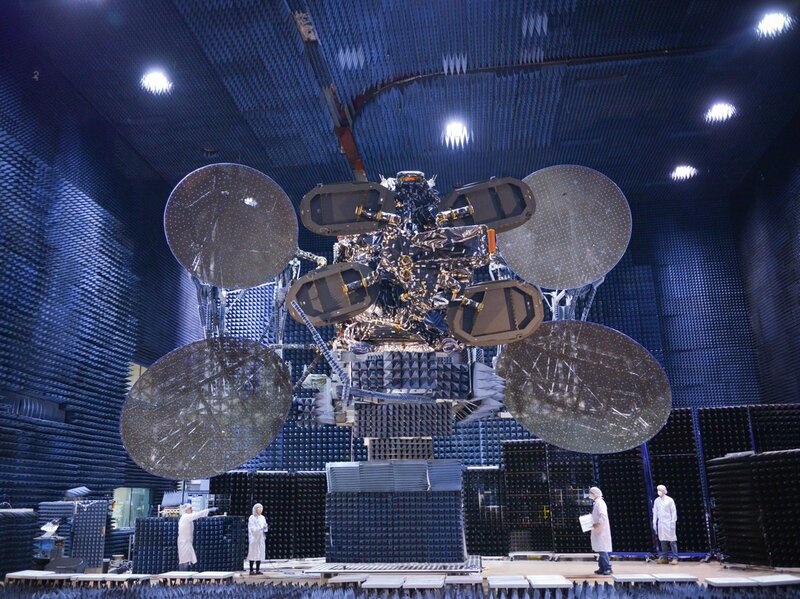 The satellite hosts 78 high-power Ku-Band transponders, 61 of which will be in use at any given time to deliver up to 169 simultaneous active channels. Under operation by Dish Network, the spacecraft’s payload exclusively uses spotbeam technology to deliver Direct To Home television services to a customer base of nearly 14 million. BRISat, the Bank Rakyat Indonesia Satellite, is the first dedicated satellite for banking purposes, set to deliver reliable communications services to BRI’s 11,000 bank branches across the Indonesian Islands as well as connecting 237,000 electronic channel outlets. The 3,540-Kilogram satellite hosts a hybrid communications payload comprised of 9 Ku-Band transponders and 36 C-Band transponders, designed to meet public demand for access to easy, safe and fast banking products, no longer relying on terrestrial connectivity between Indonesia’s islands. BRI currently plans only to use 18 transponders of the satellite’s payload with an additional four operated by the Indonesian government for a variety of purposes. The spacecraft will take up station at 150.5 degrees East from where it can deliver coverage to the Asia-Pacific Region. 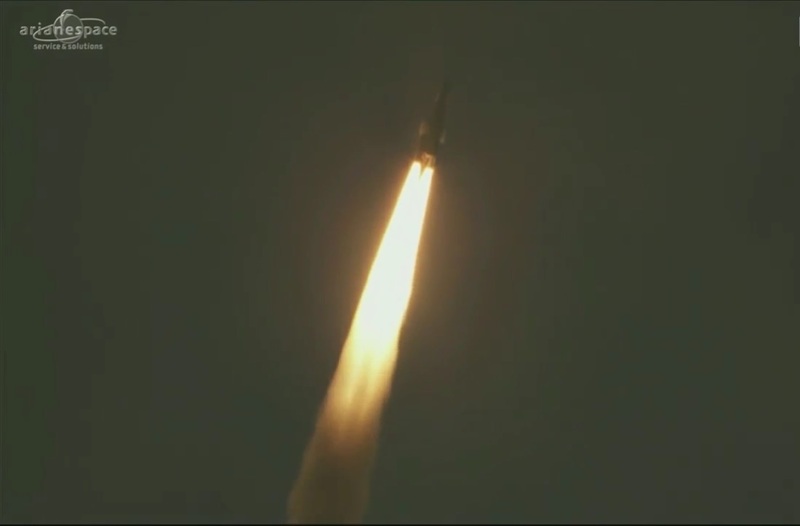 Saturday’s launch marked the 86th flight of the Ariane 5 rocket and involved the 533rd and 534th satellites orbited by Arianespace in the company’s 36-year history. The next Ariane 5 mission is currently on the books for August 24, carrying the Intelsat 33E and Intelsat 36 satellites.